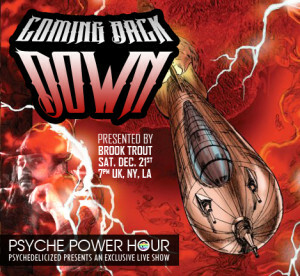 This week on Psyche Power Hour, special guest DJ Brook Trout presents “Coming Back Down.” Whether you’re returning from outer space or just winding down from work, this collection is gar-ohn-teed to leave you laid back and loose. You won’t even need to drop a ‘lude! So walk right in, sit right down, baby let your hair hang down, Saturday 7 PM UK/NY/SF.